How to turn Firefox into a WebApp Assault Kit. 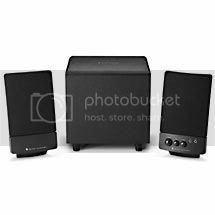 Ever seen these speakers at Walmart for 25-30 bucks? I bought a pair, and here's my review on them. First off, theres 2 speakers, and a sub woofer, theres 3 knobs on one of the speakers, Volume, Bass, and Treble. There's also a Headphone and Mic Jack on the same speaker, and the green/red combo cord to go with it. So-called "Subwoofer" speaker is 4 inches and Paper. Wasted space on speakers, could be made thinner. Not sure if this is a con, but the speakers are very lightweight. If you need some quick speakers, get them, the price is amazing for what you get. I have my set in my bathroom for my iPod. Or if you need them for a quick pc build, they are not bad at all.